“Earlier, we used to be scared of putting up our stalls out of the fear of being evicted anytime and our material being snatched away by authorities,” shares Madhobi Kalita, 33, running a tea-stall at Uzan Bazaar in Guwahati, Assam. 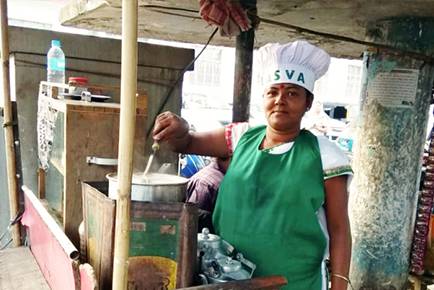 “However, with Assam Street Vendors Association [ASVA] now being an active and strong organization fighting for vulnerable street vendors, we feel very empowered,” she further adds. ActionAid India, along with its ally, Society for Social Transformation and Environment Protection (sSTEP), has been working with workers in the informal sector since 2001. As part of our efforts, we have been mobilizing street vendors across the state on issues of livelihoods, social security and a life of dignity. These efforts, over time, led to the formation of a strong street vendors’ collective, which eventually got registered as Assam Street Vendors Association in March 2014, with an initial membership of nearly 30,000 street vendors from 11 districts of Assam. Since then, ASVA has been leading advocacy campaigns on access to social security, and other rights and entitlements for street vendors. sSTEP and ActionAid India have also been organizing leadership and capacity-building programmes for street vendors. Madhobi attended one such training last year – on Health, Hygiene and Food Safety. “The training was an eye-opener for me since before that, I didn’t know how important hygiene and food safety were from customers’ point of view. Now, I try to maintain hygiene at my stall and the results are very encouraging. I now get more customers at my stall,” says a beaming Madhobi. She opens her stall 20 days a month and gives the remaining time to her 17-year-old son and her husband, who is bed-ridden. Located very close to the Guwahati High Court, Madhobi’s tea-stall is now running well, bringing her a good income to support her son’s education and to run the household.